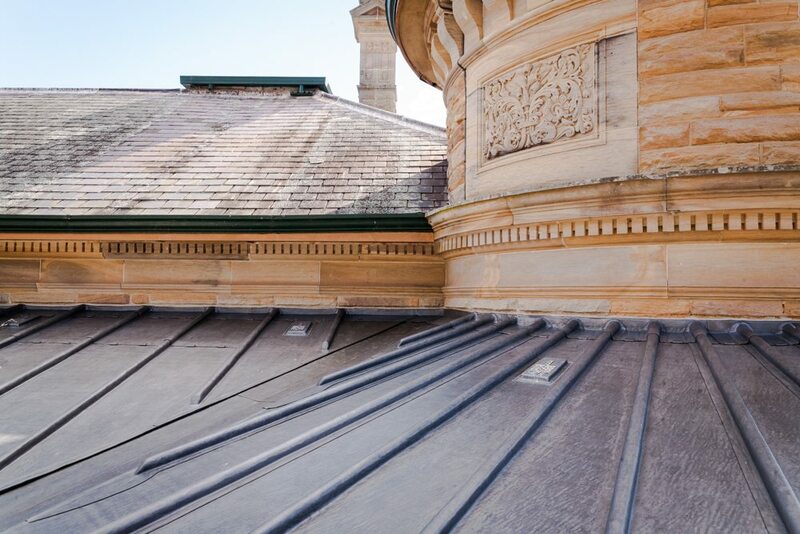 “Architectural Leadwork Pty Ltd was established in 2003 to meet the need for quality lead work in and around the Sydney area. With a focus on employing master tradesmen and a passion for the preservation and restoration of historic buildings, the business has understandably earned a reputation for outstanding workmanship. Midland Lead supplied 14 tonnes of lead sheet which was used in the roof area of this magnificent building. 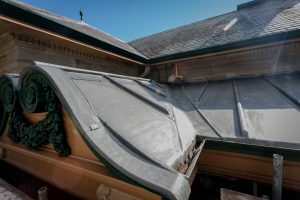 The work was carried out by Architectural Leadwork, a specialist in heritage restorations who installed 40kg code 8 lead sheet in batten roll design with multi-lay felt, and fixed with copper nails. All the lead was bossed and shaped using traditional lead skills and finished with Midland Lead patination oil. Cover flashings were 25kg code 5 recessed into the wall and finished with elastomeric joint. The historic Belmont Park Mansion House in North Richmond, New South Wales was built in the late 19th century by Philip Charley. At the age of 18, Philip then a lowly jackeroo was given the opportunity to become one of the original seven members of the Broken Hill syndicate. This was a mineral prospecting company which uncovered one of the most valuable mineral deposits in the world, out of which developed the largest public company in Australia. At age 18 Philip had little grasp of ‘what may be’ and sold half his interest for just £100. However, his remaining interest still made him rich beyond his wildest dreams. He purchased the historic landmark that was known as Belmont in North Richmond, demolished the original house and set about building the Italianate sandstone mansion which still stands today. The mansion and grounds were purchased by the Catholic order of Brothers of St John of God in 1952 to provide a safe place for men to receive care for mental illness. Today it remains one of Australia’s most renowned private psychiatric hospitals. Architectural Leadwork Pty Ltd. were the successful tenders to supply and install lead sheet in batten roll to the veranda roof area of the main house. The company was established in 2003 to meet the need for quality lead work in and around the Sydney area. 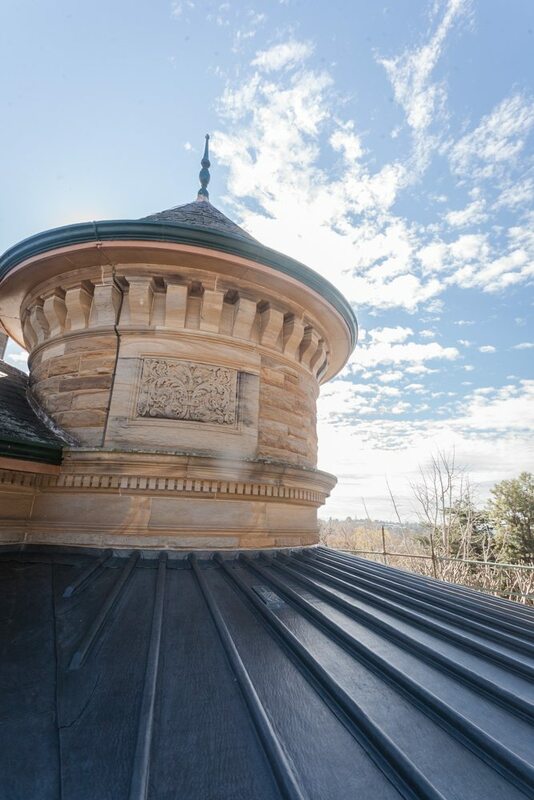 With a focus on employing master tradesmen and a passion for the preservation and restoration of historic buildings, the business has understandably earnt a reputation for outstanding workmanship. British based manufacturer Midland Lead has over 30 years’ experience in the manufacture of lead products, which are now exported all over the world. The company is one of the few manufacturers to also produce sandcast lead, made using the traditional method and used on prestigious historical building throughout the UK. “Midland Lead’s extensive knowledge of lead-lined plasterboards proved invaluable for this project."